The Thai Red Cross Society provides disaster assistance to flood victims. 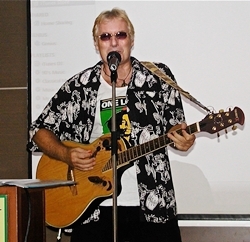 This was the topic of Sawanit Kongsiri, Assistant Secretary General for External Relations for the Thai Red Cross Society, when he spoke to the Pattaya City Expats Club at their November 13 meeting. 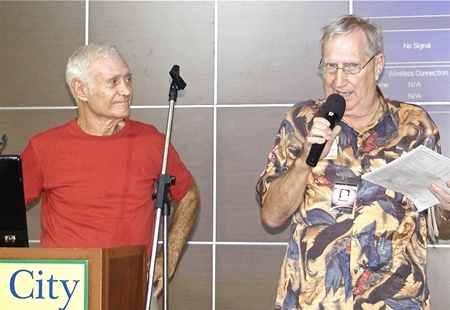 Club Chairman Michel de Goumois introduced Sawanit noting he has had a distinguished diplomatic career, having served as Thailand’s ambassador to several countries including China and Australia and has also held several posts in the Ministry of Foreign Affairs including Deputy Permanent Secretary. Sawanit Kongsiri, Assistant Secretary General for External Relations for the Thai Red Cross Society, shares the history of the Red Cross in Thailand and its many activities. Sawanit gave some background on the Thai Red Cross Society and the worldwide Red Cross and Red Crescent organizations, which are represented in some fashion in most countries. The Thai Red Cross Society was founded over 117 years ago and its Council President is Her Majesty Queen Sirikit. The Executive Vice President is H.R.H. Princess Maha Chakri Sirindhorn. Red Cross and Red Crescent societies are guided by seven fundamental principles: Humanity, Impartiality, Neutrality, Independence, Voluntary Service, Unity, and Universality. He then described the four core areas of the Thai Red Cross Society; those being (1) Medical and health care services, (2) Disaster preparedness and response, (3) Blood transfusion services, and (4) Quality of life promotion. Sue K. of Pattaya Mail TV interviews Sawanit after his excellent presentation. He pointed out that they operate two teaching hospitals; one in Bangkok and the other in Sriracha. They also have 12 centers throughout Thailand for blood donations. In promoting the quality of life, he stated that they do this mostly in rural areas to help the elderly and disabled. They also produce snake anti-venom for all of Thailand. Sawanit then got into the heart of his topic, the devastating floods in Thailand and the assistance being provided by the Thai Red Cross Society through its volunteers. With the aid of pictures, he described their various activities to assist flood victims. He also pointed out they also wear the distinctive Red Cross to show that they are there to provide assistance and do not represent any particular government agency or political party. 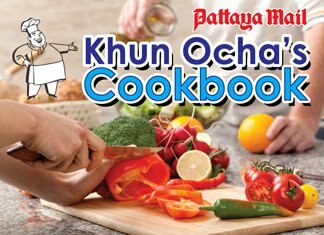 The Amari provides a sumptuous buffet with red and white rice and omelets cooked to order, for Pattaya City Expats members and guests. One of their activities is the Mobile Medical Units. These are flat bottom boats that can travel in the flooded regions; they are staffed with a doctor, nurse, and pharmacist to provide medical and health care. Red Cross Relief Kits are also being distributed by many volunteers. These kits contain many things including non perishable food and other essential items. He noted that in preparing the kits, they take into consideration the area where they will be distributed. For example, in the Northeast, they provide sticky rice instead of regular rice. Each kit is also in a plastic bag that can float. These items are transported by large trucks that were provided by various companies and others to aid in the relief effort. He pointed out in several of the pictures, the volunteers were wearing red Coca Cola T-shirts; this was because Coca Cola sent many of their employees to assist as volunteers. Mobile Kitchen Units are also set up and can provide hot food for many. He again mentioned that all of this is done by volunteers. In one location that was close to a prison, he said the warden allowed prisoners to volunteer to help with the kitchen. He also described how they had set up areas where volunteers pack the relief items in assembly line fashion. Much of the items are donated and these volunteers take special care to ensure that items are not past their “use by” date. They also have available if needed, mobile water purification trucks. Likewise, they have the Vejapaha, a floating clinic that was donated many years ago by His Majesty the King. However, it is of limited use at present because the flooded areas are too shallow. Sawanit concluded by commenting on the amount of donations they have received for flood disaster assistance. As of November 11, they had received cash donations of around 406 million baht. But, they also had received many donated items of food, clothing, etc. Sawanit also pointed out that the areas where the Red Cross is assisting are not the same areas that are receiving government assistance, so that they are not working at cross purposes or duplicating effort. 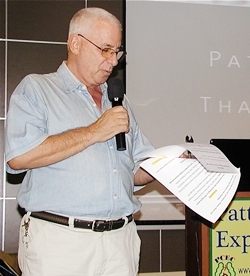 After Sawanit answered many questions, Master of Ceremonies Richard Silverberg called on Pat Koester to update everyone on upcoming events and to conduct the always informative Open Forum where questions are asked and answered about living in Thailand, Pattaya in particular.